Fundamental studies on the nanopreparation of neutral analytes in CZE by analyte focusing by micelle collapse (AFMC) are presented. The background solution (BGS) is prepared using an electrolyte salt (i.e. sodium or ammonium acetate). 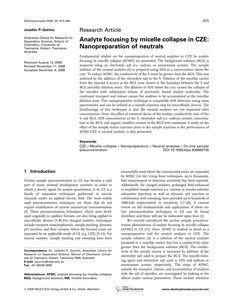 The sample solution of the neutral analytes (S) is prepared using SDS at a concentration above the cmc. To induce AFMC, the conductivity of the S must be greater than the BGS. This was achieved by the addition of the electrolyte salt to the S. Dilution of the micellar carrier from the injected S occurs at the BGS zone closest to the boundary between the S and BGS (micellar dilution zone). The dilution of SDS below the cmc causes the collapse of the micelles with subsequent release of previously bound analyte molecules. The continued transport and release causes the analytes to be accumulated at the micellar dilution zone. This nanopreparative technique is compatible with detection using mass spectrometry and can be utilized as a sample injection step for microfluidic devices. The disadvantage of this technique is that the neutral analytes are not separated after concentration. Here, the effect of retention factor of the analyte, conductivity ratio of the S and BGS, SDS concentration in the S, electrolyte salt (i.e. sodium acetate) concentration in the BGS, and organic modifier content in the BGS were examined. A study on the effect of the sample matrix injection prior to the sample injection to the performance of AFMC-CZE to neutral analytes is also presented.